This ultimate dumper has advanced features from solid all welded steel construction to the Emergency Brass Velocity fuse in the cylinder. Main components include a 24V hand held pendant control, 56 frame motor, upper travel limit switch to reduce wear on the components. 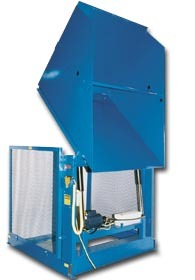 Safety features include: side rail guards, floor hold down brackets, adjustable hold down bar, 3,000 psi hydraulic component rating, integrated brass velocity fuse mounted inside the cylinder. Painted Royal Blue. FOB Shipping Point. Product No. Cap. (lbs.) Dump Height Reach Level Height Chute Width Chute Length Rotated Height Length Frame Width Wt. (lbs.) Price Ea.